Dry sandy fields, jack pine plains, oak and aspen forests (especially along borders); clearings, rocky openings, occasionally along roadsides and railroads. 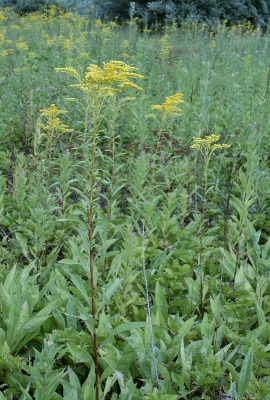 This species is typically the first goldenrod to start blooming (in July), except in the Jack Pine plains where it generally follows S. simplex and S. speciosa var. jejunifolia, but it has a long season. The tiny, nearly linear, entire leaves or bracts which are usually present on the uppermost portion of the stem are often conspicuous and helpful for identification, especially when the large basal leaves are missing. The later generally have blades ca. 7–20 cm long, on petioles half or more as long. Occasionally the branches of the inflorescence and, more rarely, the stem have rather sparse, spreading pubescence, but usually these parts are glabrous. Very rarely the branches of the inflorescence are not one-sided (see comments under S. speciosa). MICHIGAN FLORA ONLINE. A. A. Reznicek, E. G. Voss, & B. S. Walters. February 2011. University of Michigan. Web. 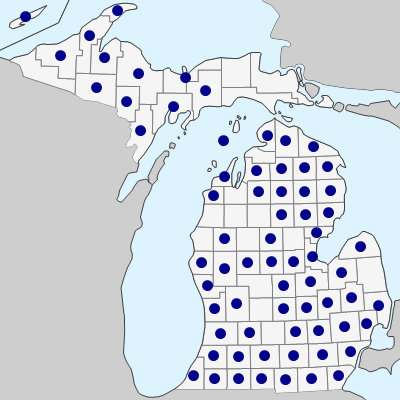 April 19, 2019. https://michiganflora.net/species.aspx?id=459.